Flama is a 14-year-old boy whose parents are going through a divorce. His mom goes out to run errands on a Sunday, leaving him and his friend Moko to amuse themselves. What looks to be a routine day of playing “Halo” takes a turn when the power goes out. Then Rita, the 16-year-old neighbor, shows up wanting to use the kitchen. And then there’s Ulises the pizza delivery guy who won’t leave until he’s paid, and the boys won’t pay because he was 11 seconds late (this dude takes longer breaks than Mookie in Do the Right Thing!). You could draw easy comparisons to 25 Watts. 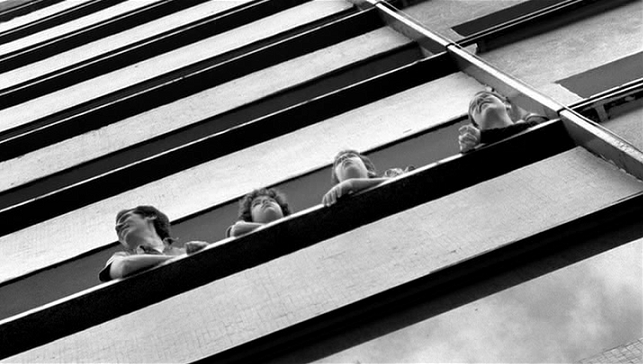 A Latin American, black and white, low-budget Jarmuschian indie about young people hanging around doing nothing. Sure, the kids are a little younger and it’s Mexico instead of Uruguay, but it’s basically the same thing, right? Not exactly, nor do I think director Fernando Eimbcke is ripping off Rebella and Stoll. There are a lot fewer annoying, self-conscious stylizations, for one thing. Eimbcke lets the simplicity of the narrative breathe unencumbered, relying on the natural talents of his performers to engage the viewer. There are a few moments where he indulges in a fantasy sequence, but they’re not the least bit unwelcome and fit into the harmony of the film. I also liked the tribute to the Beatles “blue album/red album” covers, even if it might be a little too clever. This film swept (might be more appropriate to say CRUSHED) the “Ariel Awards” in Mexico. I don’t know what the competition was, but I have no objections. It’s a real charmer of a movie. These four young actors really play wonderfully off each other, and the relationships between the characters are a joy to watch take shape. Each of them is looking for a support system of some sort, and although there are antagonistic moments, the bonds between them are tightening, all of an afternoon. It also deals with issues of pubescent sexuality in a very sensitive, honest, tasteful and organic way. There’s a lot of humor (boredom is rarely so entertaining) and warmth and lovely, tender little scenes of humanity. I’m actually reminded a little of The Breakfast Club, but without the 80’s baggage, obnoxious bits, or terrible ending. The cinematography also looks pretty damn good, and except a couple of songs that were too loud/annoying for my tastes, the music was very nice as well. This entry was posted on April 14, 2012 at 2:04 am	and is filed under Movie Reviews. You can follow any responses to this entry through the RSS 2.0 feed. You can leave a response, or trackback from your own site.